The Mano di Ferro [Iron Hand] that leads the bloody Comanche rebellion is not just one man! There are four Native Americans under the orders of the Apache Isidro, dressed in Spanish conquistador armature and leaders of an unstoppable army! 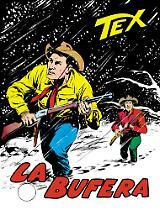 Tex does not give up: first he cuts off the arms traffic that supplies the rebels from Laredo and then he entices the Indians into a deadly trap based on machine guns and dynamite. Meanwhile, the menacing shadow of the witch, Zhenda, stretches over the Highlands! The vixen aims to install her son, Sagua, as chief of the Navajos in Texs place, and she doesnt hesitate to kill in order to do it. 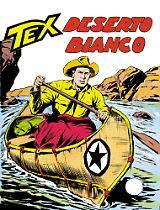 In this issue: the preceding adventure extends from page 5 to page 64; from page 64 to page 130, Sinistgri presagi.